G2004 Blue team, under the guidance of Coach Manu Appelius, had a fantastic tournament last weekend in Thousand Oaks. 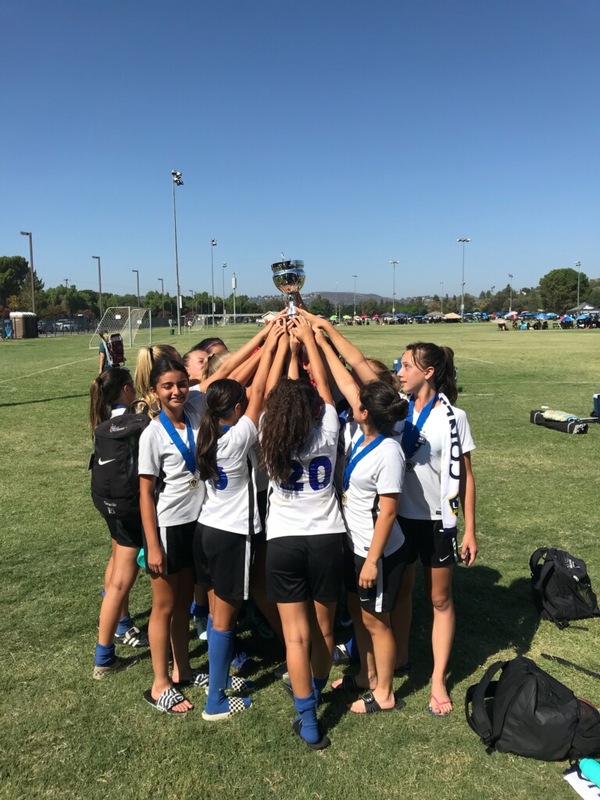 The girls participated in the LA Galaxy CV Summer Cup 2018 and, after a slow start, climbed all the way up to victory. The team started with an unconvincing and somehow sloppy performance, ending up with a 3-2 loss vs. Ventura FC Strikers. Lots of squandered opportunities up top and a few mental mistakes too many, ended up in a disappointing loss. The girls needed to bounce back and get a win in order to advance to the semifinal. Although they still had a few moments of distraction, the team got a convincing 5-1 win against United Rancho Conejo. 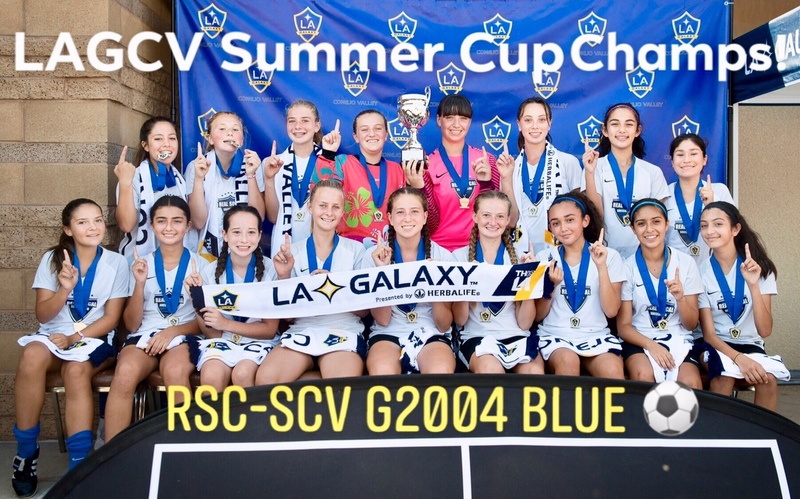 On Sunday, the girls faced home team LA Galaxy CV in the semifinal and went down 1-0 after 20 seconds from the start. The team worked extremely hard and finally showed all their qualities: great heart and determination, an outstanding possessions game, tough defense and goalkeeping and excellent vision and soccer IQ. The team quickly tied the game and went up 2-1 right before half time. Charline Lazo scored both goals. In the second half, goalkeeper Priscilla Little saved a penalty kick and the team held on to the lead to advance to the final. In the final, the girls faced Ventura FC Strikers for a second time and got a chance to redeem themselves. Once again, the girls had an excellent performance winning the game 1-0, with a goal from Annie Zaccaro, and also getting close to a second goal multiple times. The team ended up with 10 goals scored (4 by Charline Lazo, 2 by Alyssa Raffi and 1 each by Kayla Young, Izzy Benavidez, Olivia Becerra and Annie Zaccaro) and 5 against. After a slow start, the entire roster had outstanding performances. Roster is completed by Brianna Preciado, Gracie Bennett, Isis Garcia, Julia Desmet, Kamrin Schultz, Katherine Moylan, Nadia Natour, Santana Rivera, Sravani Khanal and newest addition goalkeeper Laura Brennan.